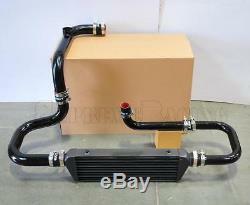 Support up to 400HP and 35PSI. Compress air flow rate: 700cubic feet/min. Pressure drop: 0.2-0.5 at 15PSI, 2-5 at 35PSI. Full size: 27.5'' (L)x 7''(H)x 2.5''(W). 1x 2.5 In/Outlet Intercooler. 3 x 2.5 OD Aluminum Pipings. 2 x 2 OD Aluminum Pipes. Instruction is Not Included, Professional Installation is highly recommended. Direct bolt-on design for bottom mounted T3/T4 driver side exit downpipe turbo setup. For other turbo setup, modification is require. Depend on the size of the Package. Handle : Usually takes 24 48 hrs. Business time for the processing Saturday, Sunday and US Holiday does not Count! Powered by Solid Commerce The All-in-One Listing, Inventory & Order Management Solution. The item "RDT Black Intercooler Piping SSQV Flange Coupler kit for 1994-2001 Acura Integra" is in sale since Tuesday, August 8, 2017.